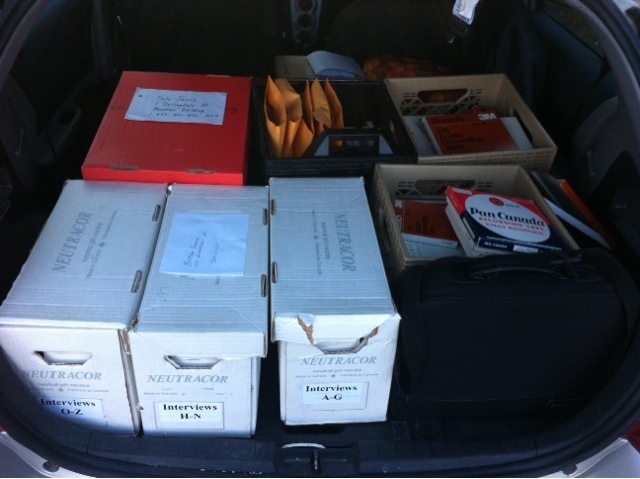 ICH Blog: This is what a trunkful of oral histories looks like. This is what a trunkful of oral histories looks like. I'm on the road today, heading to Deer Lake, where the Grand Lake Centre of Economic Development (GLCED) will be hosting its Annual General Meeting. I'm going to be talking to them about heritage projects, intangible cultural heritage, and ways in which the Heritage Foundation of NL can help communities safeguard what matters to them. Along the way, I'm dropping off this pile of oral history material back in Grand Falls-Windsor: three crates of reel-to-reel tapes from the Hiram Silk collection, three boxes full of oral history transcripts, and another banker's box of audio recordings. We've been toiling to digitize all of this material, and the work with the physical records is now complete. You can listen the interview I did on the Hiram Silk material here or check out all those interviews here. The other Grand Falls-Windsor oral history interviews were featured in an article by Terra Barrett in our last newsletter. She'll be finishing up the metadata work on that shortly, and we'll post when all of it is online. And I'm off! See you soon, Deer Lake! Do you have a community oral history collection you want help digitizing?